First place among the Sacraments of the Orthodox Church is occupied by Holy Baptism, by which a man, who has come to believe in Christ, by being immersed three times in water in the Name of the Holy Trinity (Father, Son and Holy Spirit), is cleansed through Divine Grace of all sins (Original Sin and personal sins) and is reborn into a new holy and spiritual life. This Baptism serves as the door through which man enters into the House of Eternal Wisdom (the Church), for without it, a man cannot be united completely with the Savior, become a member of His Church, receive the other Sacraments, and be the heir to Eternal Life. As the Lord Himself said, in His discourse with Nicodemus, "Truly, truly, I say to you, unless one is born of water and the Spirit, he cannot enter the Kingdom of God." (John 3:5) In the Sacrament of Baptism, man is called out of spiritual darkness into the light of Christ and is initiated into the economy of salvation by the Son of God. This initiation is effected, however, in the Sacrament of Chrismation. "Repent, and be baptized every one of you in the Name of Jesus Christ," the Apostle Peter preached to the people on Pentecost, "and you shall receive the gift of the Holy Spirit." (Acts 2:38) Since that time the Divine Gift of the Holy Spirit is bestowed upon each person who rises from the baptismal font. And everything the Holy Spirit touches receives the seal of an invaluable treasure, a ray of eternal light, and the reflection of Divine action. The Sacrament of Chrismation awakens in the soul that inner, spiritual thirst which does not let one grow satisfied solely with the earthly and material, but always summons us to the Heavenly, to the eternal, and the perfect. It makes the baptized person the possessor of the Spirit bearing beauty and a partaker of sanctity, of the Unwaning Light and Divine Life. It is for this reason that in Chrismation the new member of the Church not only receives the Spirit within, but is outwardly encompassed by Him, being robed henceforth as if in special spiritual garments. To be baptized and/or chrismated, please contact Father to schedule a Pre-Baptismal or Pre-Chrismation meeting. 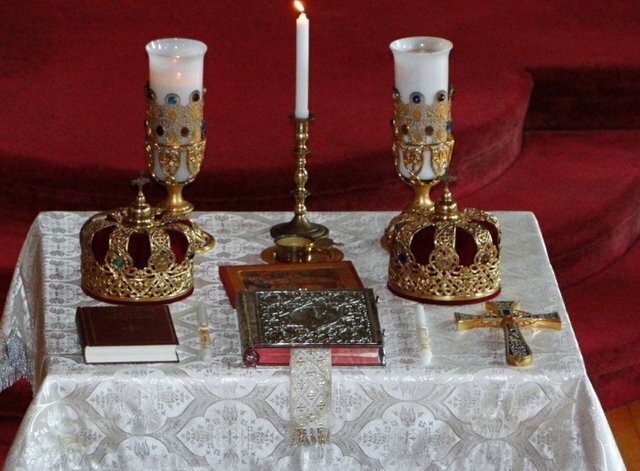 Holy Communion is offered at St. Andrew to Orthodox Christians during Divine Liturgy each Sunday and on Feast Days, as well as during the Liturgy of Pre-Sanctified Gifts held each Friday evening during Great Lent. The Sacrament of Confession developed early in the Church's history in the time of the persecutions of the 3rd and 4th Centuries, when many people, giving in to the threats of the persecutors, apostasized and fell away from the Church. Apostasy was considered to be a very serious sin; many held the extreme position that such could not be received back into the Church in their lifetime, while others held that those who had lapsed should be re-baptized - that is, their sins should be washed away by a second baptism. Moderation, in the course of time, prevailed and a penitential discipline of the Sacrament of Repentance (Confession) developed, taking on the meaning of Second Baptism; for this reason it was eventually numbered among the Sacraments of the Church. The Sacrament of Confession is heard at St. Andrew before and after Great Vespers on each Saturday. For other times, please contact Father at the church office number or via email. In the theology of the Orthodox Church, man is made in the Image of the Most-holy Trinity, and except in certain special cases (such as monasticism), he is not intended by God to live alone, but in a family situation. Just as God blessed the first humans, Adam and Eve, to live as a family, to be fruitful and multiply, so too the Church blesses the union of a man and a woman. Marriage, however, is not a state of nature, but is rather a state of grace, and married life is a special vocation (no less than the special calling of monasticism), requiring a gift or charism from the Holy Spirit - this gift being conferred in the Sacrament of Holy Matrimony. The Sacrament of Holy Matrimony consists of two parts: Betrothal and Crowning. The Betrothal is, in some way, the civil act, sanctified by the blessing of the Church. It sanctifies the intention of two persons to enter into the marital union and reflects Old Testament customs, when on those who had expressed their intentions to marry, rings were placed. This exchange of rings in the Office of Betrothal is an outward token that the two partners join in marriage of their own free will and consent, for without free consent on both sides there can be no Sacrament of Christian marriage. The Office of Crowning also contains an Old Testament element in the crowning itself, which reflects the ancient practice of placing crowns on the heads of the betrothed. This is the outward and visible sign of the Sacrament, signifying the special grace of the Holy Spirit received by the couple. These crowns are crowns of joy and martyrdom; joy for the new union, and martyrdom since every true marriage involves immeasurable self-sacrifice on both sides. To be married at St. Andrew, please contact Father to schedule a pre-marriage meeting. This Sacrament is described in Holy Scripture by St. James the Brother of the Lord: "Is any among you sick? Let him call for the elders of the Church, and let them pray over him, anointing him with oil in the name of the Lord; and the prayer of faith will save the sick man, and the Lord will raise him up; and if he has committed sins, he will be forgiven." (James 5:14-15) From the above text, we can see that this Sacrament has a twofold purpose: bodily healing and the forgiveness of sins. The two are joined, for man is a unity of body and soul, and there can be no sharp distinction between bodily and spiritual sicknesses. Of course, the Church does not believe that this anointing is automatically followed by recovery of health, for God's will and not man's prevails in all instances. Sometimes the sick person is healed and recovers after receiving the Sacrament, but in other cases he does not recover. The Sacrament, nonetheless, gives him the spiritual strength to prepare for death. Please note that this Sacrament is not only for those on their deathbed, but for anyone who is sick. It may also be performed over the healthy as well (as is the custom on Holy Wednesday). The Sacrament of Holy Unction is offered at St. Andrew on Holy Wednesday. To receive the Sacrament of Holy Unction on a day other than Holy Wednesday, please contact Father.